Grab your furry boots and mittens. Sparkly snow, bright icicles: frozen Fairyland is a magical sight. (Even if it’s chilly enough to make a penguin think brrrr.) Winter is enchanting! Crisp snow, bright sun, toboggan races. Hot chocolate round a cosy fire. 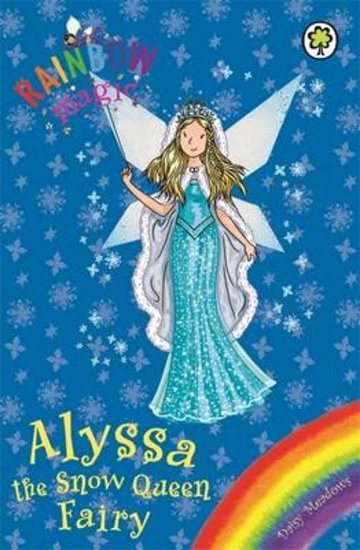 Alyssa the Snow Queen Fairy makes sure winter is a happy time. But when Jack Frost steals her magic objects, an epic chill sets in! On the plus side, it’s rather magnificent (at first). On the down side, it’s freezing! Can Rachel and Kirsty take action? Or will Fairyland be frozen forever? WOW! this book looks good, Daisy meadows is my favourite author not surprised that she’s made another good book. Definitely going to look into buying this book. Its a really good book and i enjoyed it so much that i almost fell off the bed! It’s a great book probably for people who like the movies the snow queen and Disney’s Frozen. I also like the fact that there’s 3 stories. I started reading this book yesterday and finished it yesterday. I’m very fast at reading books.